Antao was born in 1937 in the coastal city of Mombasa. He is atypical in many ways. To begin with Kenya is not known to produce world class short sprinters. Secondly people of goan decent rarely excel in the short sprints. He was born in the Makadara area of Mombasa and grew up in Makup and Ganjoni He was the first of 6 siblings born to Diogo Manuel Antao and Anna Maria Antao of Goa India. While attending Goan school in Mombasa, his running career started to take shape. He started to compete at national championships in 1957 and promptly broke the national records in the 10 and 220 yards. His international debut came in 1958 when he participated in the commonwealth games, reaching the second round. His reached the zenith of his career when he won the gold medals at the 1962 commonwealth games in Perth Australia. He also won both events at the British AAA games that same year. 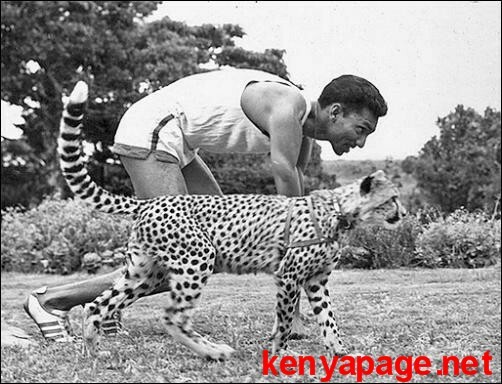 He was also the East and Central Africa championships winner at both 100m and 200m in 1961 and 1963. When Kenya became an independent nation in 1963, Antao became the first flag bearer when the team went to the Tokyo Olympics in 1964. He won the prestigious Helms Athletics Foundation award the following year, which was awarded to six greatest athletes of the six continents by the American Foundation. He received the award from the Colonial Governor, Malcolm McDonald, at Government House, now State House. He also won a double in the Czechoslovakia Championships in Prague and virtually dominated the sprints in what was then called World Class meets, in Zurich, Berlin and London, the equivalent of present day’s Grand Prix meetings. Other glorious moments include joining top athletes from the Commonwealth of Nations for a match against USA in London’s White City stadium immediately after the 1960 Olympics in Rome. The Commonwealth team, made up of runners from Britain, Bahamas, West Indies and included Antao tied with the USA team in the 4×100 yards in world record time of 40 seconds. Antao retired from athletics after the 1964 Olympics where he fell ill on the eve of his first race and a result did not perform well. The following year, he migrated to the United Kingdom where he lived until he passed away on September 6 2011. This entry was posted in Kenya's top sportsmen and women, Profiles and articles on Kenyan runners. Bookmark the permalink.